There’s been a lot of Sturm und Drang recently about the ethics and merits of digging up old tweets on pro athletes and celebrities. Some feel like it’s unfair to judge people based on what they said years ago. Others feel like it’s fair game to ask questions about racist or misogynistic comments, even if they’re a decade old. For many, the rules are different for college athletes than they are for people who have been in the limelight for many years. Regardless of how you feel, there’s no doubt that if you’ve said some questionable stuff at any point, it’s your own fault for not washing it off social media. And no company or organization with a bottom line to consider will want to hear what you have to say. 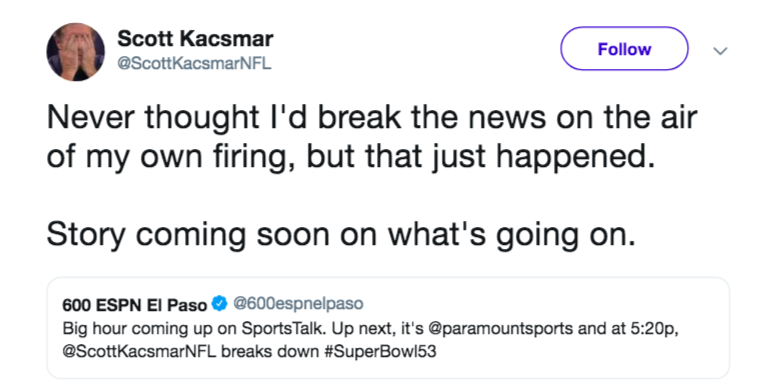 So you could already see the writing on the wall when old tweets from Football Outsiders Assistant Editor Scott Kacsmar appeared on Twitter on January 30. Twitter user Designated Kyle posted a series of tweets from 2012 and 2013 that focus on Kacsmar’s thoughts and musings about black people, specifically and in general. They don’t paint a very good picture, to say the least. Why that Twitter user decided to look into Kacsmar, who also contributes to FiveThirtyEight and previously contributed to ESPN Insider, remains unclear. But once the problematic cat was out of the bag, the tweets were retweeted by BJBSJournal and picked up by Black Sports Online on Thursday and went viral. It didn’t take long for the fallout to come back Kacsmar’s way and he broke the news of his own firing during a radio appearance Thursday evening. Never thought I'd break the news on the air of my own firing, but that just happened. Kacsmar also released a statement via his Twitterfeed. In it, he offers the “if you were offended” apology that doesn’t really cut it with anyone these days. There are some notable holes in there, chiefly that it’s hard to imagine someone growing up in what Kacsmar calls “the hood or ghetto” and not understanding the racial connotations and concerns related to that. It’s also not the best look to imply that those who grew up elsewhere don’t understand what he was really trying to say, because there’s only so many ways you can spin multiple tweets defending the n-word as a white guy. To show how much he was sorry, Kacsmar then started pushing back against people tweeting at him, trying to convince them they’re wrong. On his Twitter account, Kacsmar added “story coming soon on what’s going on,” though it’s unclear if what form that will take. We’ll update the post accordingly.